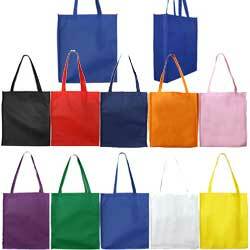 The Large Non Woven Tote Bags With Gusset has an 80gsm non-woven polypropylene construction. 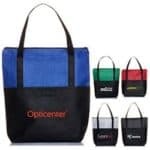 The bag has a dimension of 360mm (W) x 410mm (H) x 110mm (D) making it ideal for carrying everything from books and documents to groceries and clothes. The recipient can use the long shoulder handles to carry the bag on the shoulder or simply carry it in hands. You can take your pick from the available colour choices of royal blue, navy blue, pink, red, black, white, orange, green, and yellow. You can use this bag as a giveaway item during workshops, conferences, seminars, in libraries, shopping centres, and stationery shops. 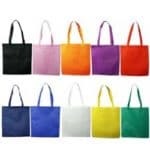 The Large Non Woven Tote Bags With Gusset is ideal for use as a promotional item. The recipient is bound to use this bag in public, giving your brand the exposure that it needs. It will not only increase brand recognition but will also build trust among the target customers. 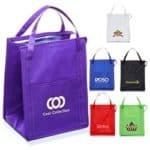 You can showcase your brand content like the name, logo, motto, and more on the print space available on the bag. The selected promotional content is printed using either the digital print or the screen print method. The price of the product includes the cost of one colour print in one position.